GUTHRIE, Okla. – A good cowboy is one who learns from experiences. Landon McClaugherty is a good cowboy, and he proved it Friday night during the second go-round of the Timed Event Championship of the World. The Tilden, Texas, man raced through five runs in 57.2 seconds and pushed his two-round cumulative time to 122.6 seconds to lead the race in this year’s “Ironman of ProRodeo” event with three rounds remaining. It was a busy day for all 20 of the top timed-event cowboys in rodeo to kick-start the championship. McClaugherty’s time is just seven seconds faster than K.C. Jones, a five-time champion from Burlington, Wyo., who held the lead after Friday afternoon’s opening go-round. McClaugherty was fourth heading into the evening performance. That’s when he showed how his Timed Event training has come into play. Past champions always say that the man who makes the fewest mistakes will win the title. That means being steady and solid is the key. Even with his final-run bobble, the Texan was pretty solid. He needs to keep that focus, especially with Jones and three-time champion Daniel Green on his tail – Green, of Oakdale, Calif., is third at 130.6. Also among the leaders is two-time winner Kyle Lockett of Visalia, Calif., who led the race until suffering a 60-second time in steer wrestling – at the Timed Event, a 60 is the equivalent of a no-time. The race is on with two days of competition remaining. ROUND 1: 1. K.C. Jones, 56.7 seconds; 2. Kyle Lockett, 57.2; 3. Daniel Green, 61.1; 4. 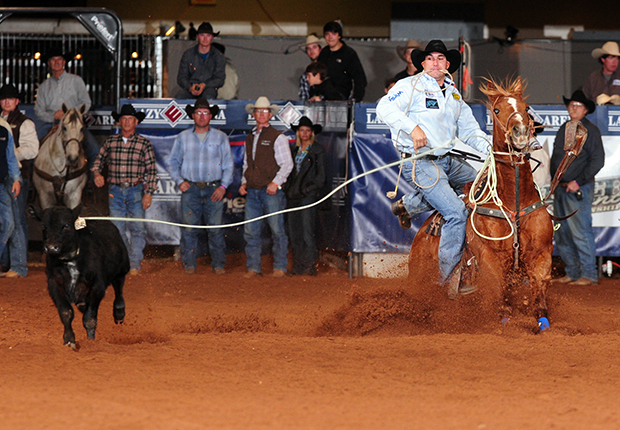 (tie) Landon McClaugherty and JoJo LeMond, 65.4; 6. Dustin Bird, 66.4. ROUND 2: 1. Russell Cardoza, 54.5 seconds; 2. Trell Etbauer, 56.8; 3. Landon McClaugherty, 57.2; 4. Paul David Tierney, 61.3; 5. Clayton Hass, 61.9; 6. Josh Peek, 64.8.